Perfect for dunking into a smooth and creamy cheese sauce or a fresh and zesty salsa, these Mission nacho chips are pre-fried to crispy, crunchy perfection! 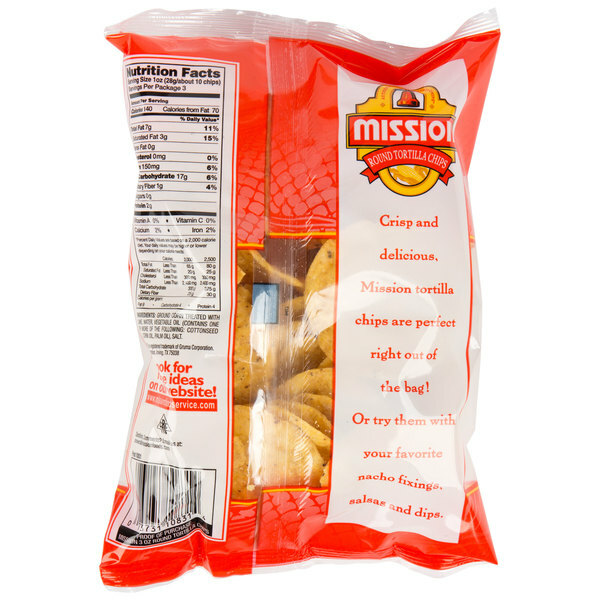 Mission brings you hearty and tasty tortilla chips with no cholesterol and convenient packaging for your concession stand, snack bar, or restaurant. With 3 oz. per bag, your staff is able to easily serve equal portions of chips with each order. This removes all guesswork, cuts down on waste, and also ensures that each customer gets a freshly-opened bag of chips and removes the risk of a stale product, which can occur with larger, bulk bags. Round and yellow, with a slightly salty taste your customers love, these nacho chips make the perfect addition to your snack bar or concession stand. The perfect size to accompany soups, paninis, or southwestern-flavored wraps, these portion packs of nacho chips can also be offered as a snack at your party or catered event. Absolutely love these chips! We also purchased the individual salsas to go along with them and boy ole boy... this makes for a very delightful snack. Just like nachos and cheese from the fair!! I was a little worried about ordering chips online, i figured it would be crumbs by the time it got to me. But they did and really good job with packaging and they showed up in perfect shape and with a great expiration date. 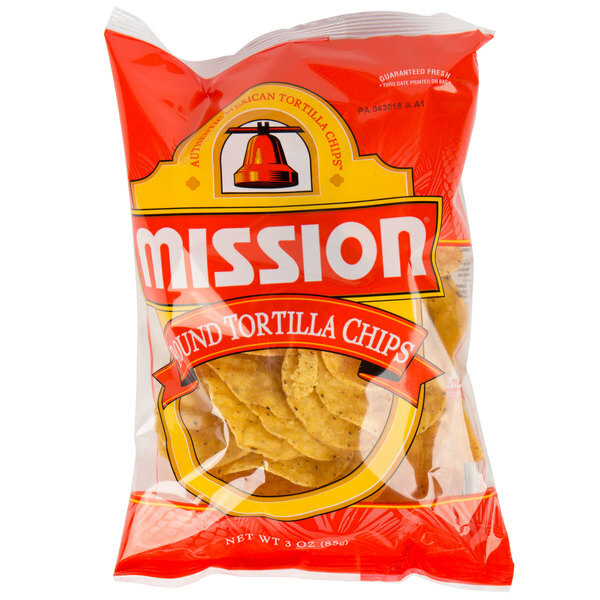 Mission nacho round chips are a must when you are making nacho cheese! We buy this brand all the time to make nachos with and sell for school functions. very nice size bag for nachos, perfect for any store, totally sealed so you do not have to worry about freshness because it will stay fresh. Perfect portion size for nachos at a great price. Always crisp and crunchy and never have an issue with stale chips. Will definitely be ordering more in the future! Just received these and we are highly impressed. We bought these for home use during gatherings and movie nights. The family will love them and that they are in individual serving bags. The chips have a good crunch and authentic flavor to them as well! Excellent Chips. We love that they are individual portions! Much easier to have quality/quantity control this way. They are always fresh and delicious! The price is very economical! I can not stop eating these chips. They are so good and when we sell them at concession stands, they sell so darn quickly. I am actually quite surprised at how cheap they were considering they are the leading brand of nacho chips.